Revolutions at Saucon Valley’s abrupt closure was a subject for discussion at Wednesday’s borough council meeting, where the same resident–Jim Gress–addressed council and asked if there is anything the township can do to help promote economic development in the area. The closure of Revolutions “adds to the blighted property down the street and the burned up property up the street,” Gress said, referring to the long-vacant Special Effects salon building at Rt. 378 and Black River Road and Yianni’s Taverna at Seidersville Road and Old Philadelphia Pike. Yianni’s has been closed ever since a fire damaged the building in June 2017. Gress asked council if anyone from the township has been in communication with the owner of the Saucon Square shopping center where Revolutions was located. According to Northampton County tax records, the center is owned by Saucon Valley Center LLC of Aberdeen, N.J.
“Unfortunately we don’t have an economic development (director)” or other employee equivalent similar to what Upper Saucon Township has, council president Priscilla deLeon said. The township’s closest equivalent is its zoning officer, she acknowledged. DeLeon said she agrees that the shopping center’s chronic vacancies are less than ideal for the township. Nearby in Upper Saucon Township, Kay Builders is currently proposing construction of a large retail-residential development on approximately 120 acres of land along Rt. 309 northbound, between Center Valley Parkway and W. Hopewell Road. Gress lamented the fact that the neighboring municipality seems to get the lion’s share of development, while commercial development in Lower Saucon Township is virtually nil. He also speculated that the owner of the shopping center could be more interested in a “deduction” than the revenue that would be generated by a fully-occupied strip mall. 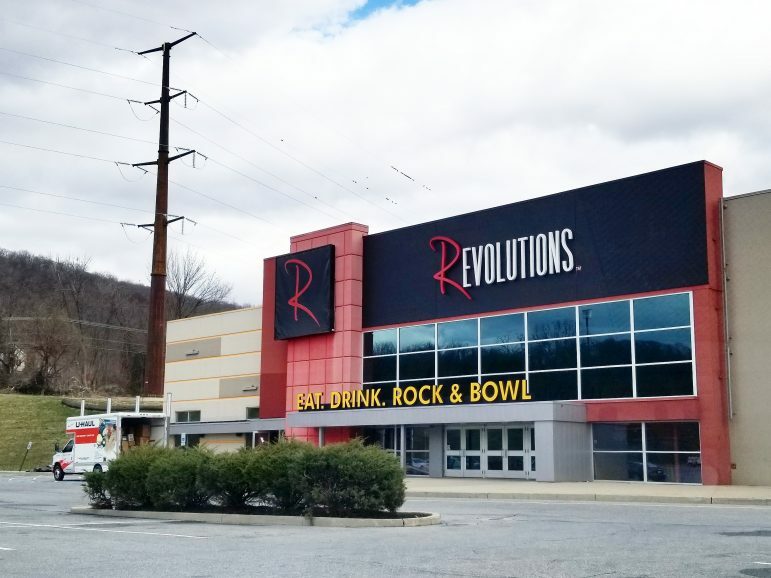 Revolutions at Saucon Valley–which closed March 31–opened in January 2013. The building in which it was located was previously a Regal Cinemas multiplex. He suggested that perhaps Revolutions could be replaced by a supermarket such as Whole Foods or Trader Joe’s. “For some reason grocery stores never took in that shopping center, and I don’t know why,” commented council vice president Ryan Stauffer, in response to Gress’s suggestion. The last grocery store to occupy a space in the Saucon Square shopping center was Pathmark, which succeeded the Superfresh that was an anchor tenant for many years. The Pathmark closed in 2011 and was eventually replaced by a Dollar Tree store and a gym, Maxx Fitness. Councilwoman Sandra Yerger said the lackluster occupancy rate at the shopping center isn’t something unique to Lower Saucon. She said she is familiar with the retail corridor just outside Doylestown borough in Doylestown Township, where she said there’s a shopping center that is also struggling. “It’s sad to see,” Yerger said. The next Lower Saucon Township Council meeting will be held Wednesday, April 17 at 7 p.m. in Lower Saucon Town Hall, 3700 Old Philadelphia Pike, Bethlehem. Meetings are open to the public and draft meeting agendas are published in advance on the township website.